1. First things first, we want to know a bit about you! How did you two meet? Chris & I have been together for almost five years now. I am an English teacher and Chris is a gym instructor. We met through common friends and that’s how our love story began! 2. Popping the question - how did it happen!? On a sunny July afternoon Chris wanted us to go out for dinner to celebrate his Birthday. When we met we walked towards a yacht restaurant that sailed across the sea while having your meal looking at the sunset and beautiful views of the Paphos shore. That was a surprise! It was so romantic that when the yacht started sailing with the lovely British live band singing my favourite song I thought that it would have been an ideal place for someone to propose-If only I had known. Chris had planned everything with the yacht manager. It was a very romantic night with a live show and at the end of the night they asked everyone to go to the deck for the fireworks! While the fireworks were on Chris kneeled in front of me and proposed. Everyone started clapping and we danced a romantic song in front of everyone before we got back to the harbour. 3. Tell us about your big day - when did you get married, where, and what was the day like? Did you have a specific theme/style? Was it traditional, or did you do things a bit differently? 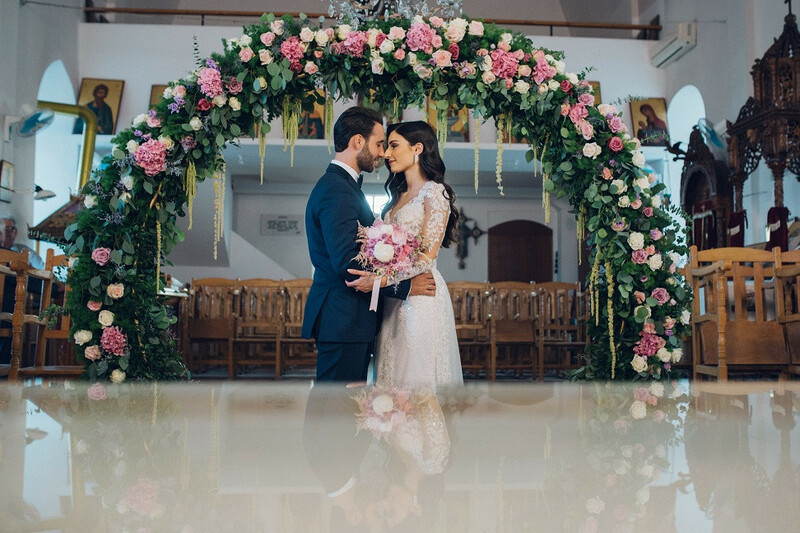 We decided to get married in May 2018 in Paphos at our favourite venue Coral Beach Hotel & Resort. It was a lovely sunny day and the church service took place in the lovely Ayia Barbara church in Armou village with panoramic views of the city. We chose flowers in purple pink and white tones with gold stands all set up by our lovely décor stylists Valanto Eftratiou. We had a big flower arch behind us in church and some flower stands outside the church. After the church service we all gathered at the venue and made an entrance in our favourite song ‘For you’ by Rita Ora and cut the cake. The most special thing about the decoration was the flower ring that was hanging from the ceiling over the dance floor. It really made the difference to the whole hall. We had a buffet dinner and all our guests got to choose from a variety of different dishes to suit everyone’s taste. During the meal there was a photo-booth operating inside the area by ‘Oh snap Photobooth Cyprus’. We chose the Magic Mirror which is an interactive mirror where you stand in front of it and take a picture; you keep a copy and the second copy goes into the Couple’s Guest Book with the guests’ wishes. After the meal we had our first dance which was a bachata choreography combined with fireworks at the peak of the song and balloons that flew to the ceiling. We thenpartied until early hours with shots served on the dance floor! 4. What was your favourite/most memorable moment of the whole day? Our first dance! It was a surprise to our guests as everyone thought we would go for a slow dance. None of us knew how to dance a bachata so we took lessons beforehand at the Beatz dance school Paphos to learn the choreography, so the result was very rewarding. 5. Why did you choose your venue, and what was important to you when making the decision? Coral Beach Hotel is a 5 star Hotel and has a very good reputation. It is located next to the sea and the terrace next to the hall looked very romantic. The venue hall looked lovely with the wooden ceiling and marble floor so we had no doubts at all and booked it straight away! 6. The dress/suit - where did you find it, and what was it like? Who did you take with you dress/suit shopping and how did you find the whole experience? Chris got his suit with his best man. They went to the KOUROSS Limassol shop together and as soon as he wore the specific one he knew straight away that it was the one. My wedding dress was made by my lovely mother whose job in the UK used to be a wedding dress maker! It was such a special feeling!! We designed it together and went to buy the fabric together. The whole process was one of a kind and so special and emotional. I loved every little detail she added and she knew exactly what I would like! I totally trusted her and I wouldn’t change a thing on it. 7. When planning your wedding, did you have any help or did you do it mostly yourselves? What were the most important aspects for you? We planned mostly everything ourselves. We started planning a year ahead. We first booked the venue in spring time as summer in Cyprus is quite hot. We prepared save the date cards for our friends and relatives living in England and straight away booked our favourite photographer Photo7Studio. As soon as we saw his pictures we knew he was the one! We didn’t have a wedding planner but we got lots of ideas and were inspired by the Wedding Planner.co.uk and our décor stylist helped us put everything together by adding our personal style and her touch too. 8. If you could give any piece of advice to current bride or grooms-to-be what would it be? The styling of your wedding needs to have a touch of your own style, don’t be affected by other people’s suggestions unless you really like them. Make a to-do list for a few of your closest friends or relatives on the day so you’ll have nothing to worry about and ENJOY your day! Be present in every moment, it is your special day and it goes by so quickly-don’t miss a thing by stressing out.